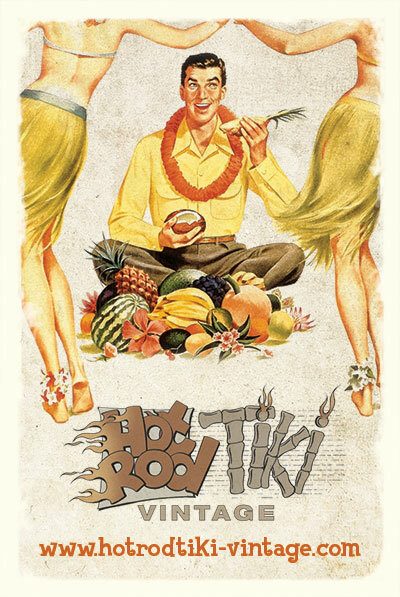 The name Hotrod Tiki is our brand and website name since 2003. Our business is run as a Partnership and is run by Sue & Dave Wright. We endeavour to ensure the accuracy of the data on our web site whenever it is possible, errors may occur. We make every effort to rectify any errors as soon as possible but we cannot be held responsible and accept no responsibility or liabilities for incorrect data. Any material downloaded or obtained from our website is done so entirely at your own risk. We describe every item on our website to the best of our ability. All dimensions indicated are approximate. Also when taking photographs of stock, colours may vary from the original due to computer resolution. If you require an item urgently or multiple items, please get in touch with us first, as we do work at a lot of shows and fairs, and sometimes we sell out of an item before it gets taken off of the website. Pricing information including packaging and postage (P&P) are available on the website for each item for sale. All item prices are exclusive of P&P. The P&P charge for each item is clearly indicated and is added on to the item price at checkout. The P&P charges are applied to each and every item separately. Payment can be in the form of Paypal, Credit/debit card, cheque and postal orders, please e-mail with your request. Hotrod Tiki do not store your payment information. Credit/debit cards are taken over the phone with World Pay Zinc, with a receipt e-mailed immediately after purchase. If paying by cheque, a five day clearing period will be required. We process and ship your order as quickly as possible, however, as with most mail order businesses, we ask that you allow one week for delivery. Most of the items are kept in stock, unless marked on the website, however sometimes back-orders do occur, when an item is back ordered we will notify you that there will be a delay or if you would like a refund. Items are sent First Class mail if in the specified weight limit, otherwise they will be sent standard parcel post, if you require special delivery requests, ie: Recorded Delivery, Special Delivery or insured, please e-mail first with your requirements. When purchasing multiples of an item, please e-mail first for shipping charges. Hotrod Tiki will ship internationally, but please e-mail us first for postage and packaging rates. When purchasing multiples of an item, please e-mail first for shipping charges. We are confident that our customers will be delighted with their purchases. If you order correctly and the item is sent out correctly, we cannot issue a refund. If an item is the wrong size, we can refund on receiving the un-worn item, but cannot refund the postage and there will be an administration charge to cover Paypal charges, etc. All returns must be made within 14 days of purchase and notified to us first. If an item is damaged on delivery, please notify us first and return the item to us, once received we can process a claim, and send a replacement. 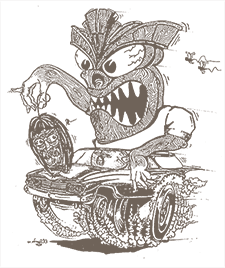 Hotrod Tiki does not collect personal information about you when you visit our website unless you choose to provide that information to us. You are free to browse this website anonymously.